Rosie and the first rooster of the day during a birthday hunt at a game production area near Hot Springs. Rosie is shock-collar free and a little giddy prior to the hunt. About this time each year, I can really feel my age. The calendar tells part of the story. My birthday is Nov. 3. This year on that date, I turned 67, an age where a guy can feel things he didn’t feel at 47 or 27. Sore things, mostly. Aching things. But there are other reasons for my annual aging epiphany, Rosie and the pheasants included. Together they can really make me feel my age, usually while we’re somewhere deep in a cattail slough or a tangle of switchgrass and clover and sunflowers. We are usually moving at a pretty good clip at such times. That’s the only way Rosie knows how to move, especially when she’s working the scent trail of a crafty rooster pheasant that is itself on the run. 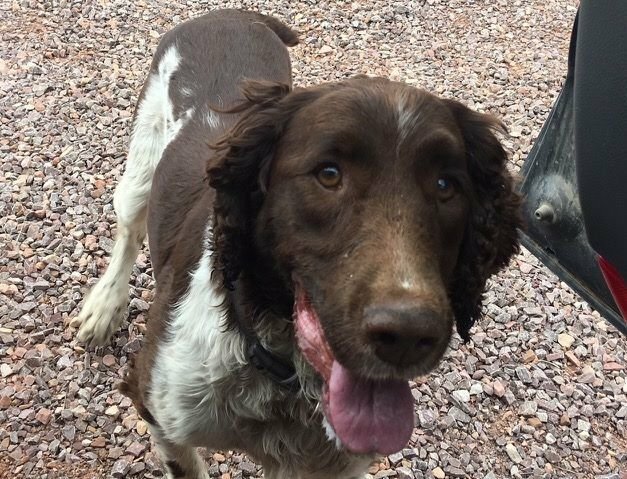 Hunting behind a field-bred springer spaniel is an exercise in hustle. 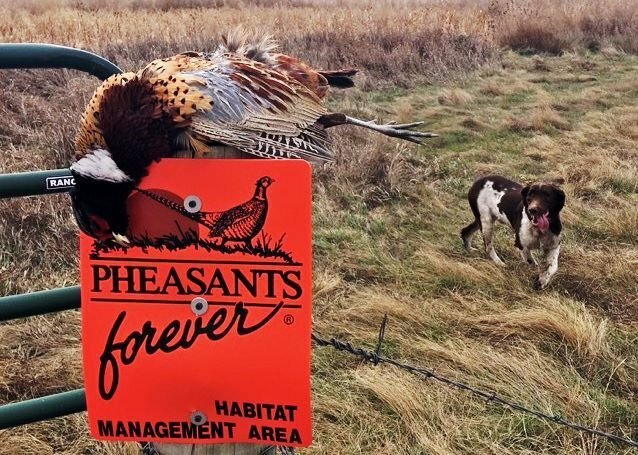 Because when the spooky pheasants decide to run rather than sit — and most choose to run, especially wild pheasants on often-hunted public land where Rosie and I do most of our hunting — they inspire Rosie to run, too. The shock collar helps there. Not that I hit the shock button much. I don’t. But I “beep” her a lot, pushing the button on the hand-held remote so that the receiver on her collar emits a little warning. Like most hunting dogs, Rosie understands that sound. It means she has to wait up for the aging human struggling through the thick stuff behind her. She also knows that if she ignores the “beep” several times, the collar will sting. I prefer not to use the shock option. And as you can imagine, Rosie prefers that, too. And she’s no fool. So the beeps are almost always enough to keep her from getting too far ahead and flushing the birds out of range. I had two springers before Rosie and managed to hunt without a shock collar. I used a ultra-high-pitched training whistle, which worked well enough most of the time. My other springers were good dogs, better in some ways than Rosie, not quite as good in others. She is stronger than either in body and will. Especially will. So midway through her second hunting season, Rosie started wearing the collar in the field. It made hunting with Rosie more fun. I didn’t realize just how much more until I showed up at a pheasant hunt I organize each year with a landowner near Holabird. When I broke out the shock collar, other hunters erupted in applause. Several of them cheered. One pretended to be weeping with joy. At least, I think he was pretending. Since then, the collar became essential. So I was concerned on Nov. 3 — my birthday pheasant hunt — when I rummaged through my SUV at a state game production area near Hot Springs and realized I’d forgotten the collar. Rosie seemed to realize it, too, and got a little giddy. I dug around in my hunting bag and found the dusty old Acme high-pitched dog-training whistle I used before the shock collar. Rosie recognized the sound affectionately, seeming to remember that it was all warning and no sting. Over the next few hours of hunting, I peeped and piped often enough to keep her in range, most of the time. But I also had to hustle even more than I do when Rosie wears the collar. It was windy and Rosie sometimes couldn’t hear the whistle, or pretended not to. After three or four hours of hard hunting on hard-hunted ground, we came home with two roosters and six sore feet. And while we did OK with just the whistle, I won’t be forgetting the collar next time.